The tiny island of Ithaca has a rich history, acting as the scenic backdrop for mythological epics like Homer's Odyssey. Ithaca has been inhabited since the second millennium BC and has been occupied or ruled by the Romans, the Byzantine Empire, the Normans, the Turks, the Venetians and the French, as well as briefly being a British protectorate, so the island has a rich and rather tumultuous history. But you would not think so when exploring the lovely countryside: the mountainous interior hides pockets of cypresses, pines, and olive trees and some of these are ancient; one of the olive trees is thought to be at least 1,500 years old. There are also some Neolithic and Early Hellenic ruins on the island. Nowadays, Ithaca is home to a number of traditional villages, with a few museums and beaches. The best beach is arguably Filiatro, which has olive trees growing all the way down to the shoreline and a peaceful bay which is lovely for swimming. Vathy, also known as Ithaki Town, is the largest town, where many of the island's roughly 3,000 inhabitants live. The town is a popular port for yachts and other small pleasure cruises in the Ionian Islands, and has some good restaurants and shops. In fact, Vathy has one of the largest natural harbours in the world. 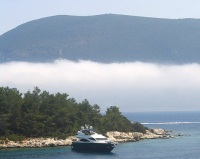 Ithaca is near enough to Cephalonia to make for a fun and interesting excursion or weekend away.